BEST-IN-CLASS Sports Team Management App. EASY TO USE Sports Scheduling Software. EASY for Users to Register, Make Payments, Check Schedules and Standings, Communicate, and more! Are you tired of wasting time managing your sports team, club, league, or association? Are you ready to start getting back into the game? SquadFusion Sports League Management Software can help you take charge! That’s because it automates many of the administrative tasks for sports teams. Now you can start running them like a machine in the background. With SquadFusion League Software, you can focus on what’s important — your players and the game. Feeling bogged down? We can change that with EASY TO USE Sports League Management Software. Get a FREE Demo. Do you look forward to updating your website for each new season? Is registration time always problematic? Worse yet is trying to chasing down payments? Does it take you days or weeks? With SquadFusion you can be done in minutes. Create a registration form tailored to your needs in minutes. All the flexibility you need without the hassle. Read More about Custom Registration Forms. SquadFusion integrates payments with registrations so that you can collect up front. No more chasing down late fees and having awkward conversations. No more dealing with bounced checks. You’ll have your funds fast. After the first transfer is successful, funds are in your bank within two days. SquadFusion gives you the ability to customize payment options. You can offer multiple fees linked to choices you provide in the registration. They can include installment plans, minimum deposits, early bird pricing, and family discounts. Read More about integrating Payment with Registration. Flexible scheduling allows you to create events how you want. Create a master schedule that gets pushed down to squads. Create schedules squad by quad. Have events pushed up to the organization calendar. It’s up to you. Central and distributed control. You determine who can add, edit, and view different types of events. You can limit game scheduling to central administrators. Make schedules visible to everyone. You can have coaches schedule an ad hoc practice and make it visible only to that squad’s roster. Read More about Flexible Scheduling. Frustration can skyrocket when members find it hard to receive relevant information. Worse they don’t receive it. SquadFusion helps you get that critical information to your members. SquadFusion allows you to move your communication online, and out of email. Your members will thank you for stemming the flood to their inboxes and text messages. Read More about how easy it is to Communicate using SquadFusion. SquadFusion can run a draft to create rosters or assign players based on other criteria. We provide a snapshot of current player distribution across squads. We also have smart tools to help assign the remaining pool of players. SquadFusion’s smart rostering begins right at registration. Participants can be pre-sorted into different groups for easier roster assignment. Along the way, you can move players in bulk from group to group or directly to rosters. Read More how SquadFusion helps create Rosters. SquadFusion websites are clean and modern. We make it easy for your members and visitors to find information, and easy for you to keep things updated. With SquadFusion, you don’t need to be a webmaster to create a kickass website. We make it easy for you to control who sees what. You can differentiate between what everyone sees and what requires different credentials. 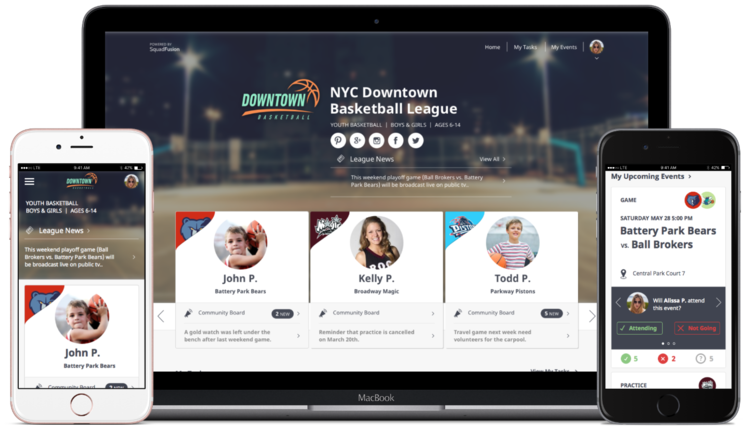 Read More about how we tailor make your website for your league. SquadFusion Sports League Management Software. Schedule events and keep track of registrations. Elevate your online brand with a sleek & modern website. Measure results for faster decision-making. Get up and running FAST (takes just 10 minutes). Create a registration form tailored to your needs in minutes. Participants can register in minutes. SquadFusion sports team management app integrates payments with registrations. You can collect fees at the time of registration. SquadFusion reports fit you precisely. They have the same level of ease and adaptation as registrations and payment options. SquadFusion is the most elegant sports league software for club administrators. View video. SquadFusion Sports League Management Software is very quick and easy to set up. View video. SquadFusion conforms to your size and style. Our sports league software requires little time for customization. "Holy crap, that was SUPER easy! I decided to use SquadFusion after researching athletic management software for years. Customer service has been beyond outstanding. I can easily and quickly make customized changes to my websites. Thank you, SquadFusion!" "Your software was created for me, it was like a destined love affair with a computer program. I'm in love with it because it lets me do things efficiently which translates to being lazy for me." I manage a Bocce Ball league for over 100 senior citizens. We were worried about organizing our league with a computer. Many members were anxious about using computers. SquadFusion was EASY to use for everyone. SquadFusion also has superior support. They customized the app to perfectly fit our requirements.